The new Ellon Academy swimming pool. 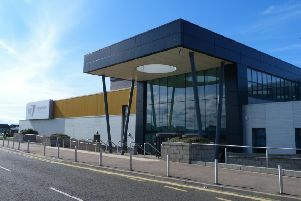 The new swimming pool at Ellon Academy Community Campus will open today (Saturday). Following minor repairs to the pool’s cleansing system, and testing of water quality, the long-awaited facility will welcome its first customers this weekend. Director of education and children’s services Maria Walker said: “We’re very pleased that pupils, the public and swimming clubs will now be able to use this fantastic new facility. The pool was unable to open when pupils first attended the new complex last Thursday due to the cleansing system fault. Meanwhile, restrictions remain on drinking water in the campus while testing in the wider building continues.